Dating to its roots in 1915, the NC Department of Transportation (NCDOT) was, by the time of my arrival in Durham, responsible for the largest system of roadways in the nation because it includes care for all county roads. Roads in rural northern Durham, where today I frequently ride my Harley, exhibit a level of engineering that often seems lacking on modern roadways and some background may explain why. NCDOT and its capacity to engineer roads had been first spurred by formation of the North Carolina Good Roads Association by towns and counties following a 1902 “Good Roads Train” tour around the state sponsored by the Southern Railway Company and the national Bureau of Public Road Improvement. The first state highway commission had been established in 1901 but lasted only for a few months. In 1911, the legislature appointed a “central highway committee” to work in cooperation with counties, to establish a central route through the state along what is now US 70 (formerly Route 10.). Before this, roads were solely a county function which was inconsistent at best. But formal organization of what is today called NCDOT, and development of its vaunted engineering capacity was incentivized by a new federal matching grant program for road construction and then soon matched by a $50 million state bond issue. In 1913, there were 10,000 motor vehicles in North Carolina or about 1 for ever 220 residents. By 1919 there were 109,000 or more than 1 for ever 22 North Carolinians. Over the next 10 years, the state would spend $200 million increasing total road-miles to 6,000. But by then, North Carolinians, shocked by roadside desecration. were already clamoring for its highway agency to do more than just lay down roadbeds. Studies had already documented tourism as the fourth largest segment of the the state’s economy and confirmed that pleasure driving and scenic sightseeing were the foremost reason for road use nationwide. By 1930, Tar Heels were up in arms at the blight from roadside billboards, litter and other roadside blight. Residents called for highway programs to incorporate litter removal and roadside tree planting. Governor O. Max Garner agreed, and North Carolina lawmakers responded, but legislation similar to other states was narrowly defeated by those insistent that agency engineers focus narrowly on only roadbeds, as it seems so many still do today. At the same time, many state and federal highway engineers including public roads chief Thomas McDonald were calling for an outright ban on roadside billboards. A statewide survey tallied in North Carolina by a highway engineer showed there were more than 2,500 along cross-state Route 10 alone. His report computed that at the average speed of 40 miles per hour back then, between Beaufort and Asheville, the view drivers hoped to see was blocked every 13 1/2 seconds by a billboard. Little did I know as I arrived here back in 1989, that North Carolina’s heralded engineering expertise at building and maintaining highways was already in the process of being systematically hollowed out in favor of private contractors. That once vaunted source of Tar Heel pride has been all but dissipated in less than a generation. Where once, North Carolina was regularly tapped to resolve national issues, it is now known more for “worst practices” than “best practices. The outcome is not lost on a bewildered general public, nor is it just related to road surfaces. In jurisdictions where expertise is still retained, roadways are now viewed holistically as ecosystems, a critical element of sense of place. As a result, true innovation and best practices around roadway design have shifted from states to cities where roads represent 80% of public space. Tree canopy along right-of-ways is valued not only for scenic preservation, increased property values and economic vitality, but as is scientifically validated , crucial for public health. At the state level, it isn’t just engineering capacity that has been hollowed out. It seems that even regulators have largely surrendered enforcement. Those who gain high office on the premise of rolling back regulations are chagrined once elected to find how much lack of enforcement and corruption, even if legal, has already made them irrelevant. As the Revolutionary War began, there were so few engineers that General Washington hired engineers from France’s King Louis XVI. Thus was established the mostly “French” U.S. Army Corps of Engineers. It wasn’t until 1835 that The Rensselaer Institute offered the first engineer’s degree in America outside the U.S. Military Academy. Environmental engineers date to Egypt around 1580 to 1200 B.C. but it wasn’t until more than 3,500 years later that in 1958 Rensselaer also became the first to offer that degree in America. This was barely two years after President Eisenhower successfully completed hostage negotiations with members of Congress including those in his own party including the father and grandfather respectively of both Presidents Bush over construction of the Interstate Highway System. Included was innovation of a funding mechanism called the Highway Trust Fund by Democratic Congressman Hale Boggs that helped achieve buy-in from special interests such as the trucking and automobile associations, which helped salvage the Interstate Highway System. The highway system was actually launched in the 1930s by President Roosevelt who envisioned it as a series of toll roads, as did Eisenhower. In 1960, when President Kennedy succeeded Eisenhower, calls to end the Interstate Highway system were once again reaching crescendo. It was under attack on three sides, from conservative Republicans due to cost, from Democrats due to private sector graft and racism related to route selection, and from bipartisan conservationists. To once again rescue the Interstate system, Kennedy called on North Carolina Governor Luther Hodges to head the Department of Commerce, which oversaw highways. Hodges brought in Rex Whitton to head highways and together they took steps that required state agencies to deepen staff engineering expertise and oversight. In August 1963, Whitton, a former highway chief in Missouri, also announced the first standards requiring that federal and thus state highway construction be sensitive not only to roadbeds, but to the ecosystems through which they ran. Following Kennedy’s assassination and stunned by the roadside desecration he witnessed during his own election campaign in 1964, President Johnson told Congress that action was needed to make highways better stewards noting that they wipe out the equivalent of a 50-acre park with every mile. He directed the Commerce department to ensure landscaping was part of all “Interstate and Federal-aid primary and urban highways.” The President also announced plans to introduce legislation on effective control of billboards, junkyards and other blight. He went on to call for trees to screen out visual blight, planting of vines and bushes on barren slopes, contours to blend with the land and easements for scenic preservation of roadsides boosting the profession of environmental engineer. President Johnson organized a White House Conference on Natural Beauty and tapped North Carolina highway chief, Dr. William F. Babcock, to chair it. Bill Babcock at the time was midway through a 12-year leave from an engineering professorship at North Carolina State University, where in the late 1970s he helped found and direct the Institute for Transportation Research and Education. As a result, highway beautification legislation was passed in 1965 “to promote safety and recreational value of travel and preserve natural beauty.” Slowed by securing letters of agreement with each state, such as this one with North Carolina, the first billboard didn’t come down until 1971. This was when Bill Johnson began his famed career as an environmental engineer at NCDOT, serving under Democrats and Republicans alike and forging North Carolina’s famed wildflower, tree planting and scenic byways programs. 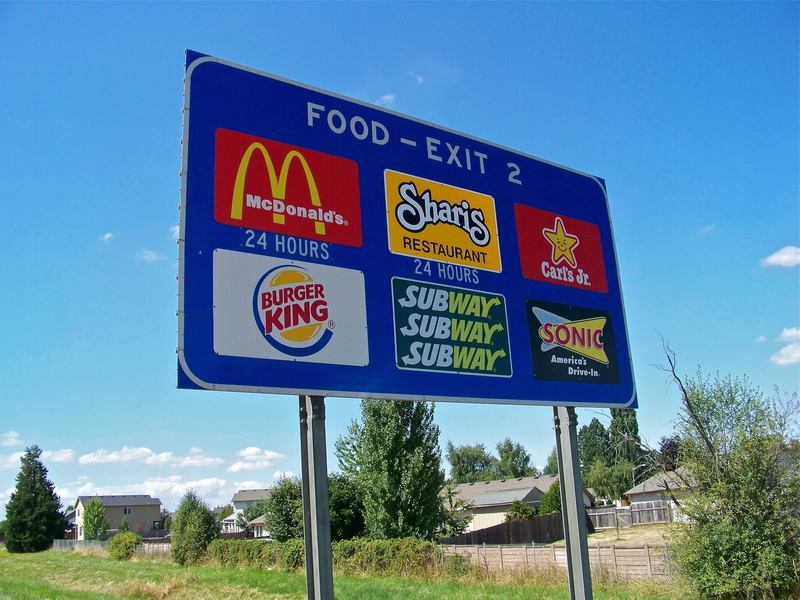 Long before smartphones did, the highway beautification act created the exit logo sign program to make billboards irrelevant. But relentless billboarders set out immediately to circumvent the beautification act to which they had agreed. In 1978, a report by the General Accounting Office reported that “in many States, motorists still cannot see significant improvement but despite efforts by billboard companies to undermine it, the Act was credited with reducing the number of billboards per 10 miles from 33.5 to 9.8. But billboarders pushed through federal legislation that year tying the hands of state and local governments from using zoning ordinances to remove and dinging taxpayers to clean up billboard blight even if they weren’t on federally-aided highways. This created a sort of gridlock over billboards that continues today. Again, a North Carolina highways chief and former mayor, Thomas W. Bradshaw Jr. was tapped to lead another inclusive 3 year analysis but repeatedly billboard interests and tourism allies in tourism were able to hamstring the group though a thoughtful report was delivered to the Reagan Administration. President Reagan and his successors including President Obama have failed to enforce billboard regulations although Reagan supported an amendment proposed in 1986 that would have ended the gridlock the billboard industry had pushed for and won in 1978. By the end of 1986, 22 years after the Beautification Act and 12 years after its implementation, 114,000 billboard had been removed but 320,000 had been erected. The Billboard lobby and its allies defeated the new measure even though it had drawn support from both Reagan and the Sierra Club. In states such as North Carolina, billboarders stalled by repeatedly agreeing to compromises but then using campaign contributions to renege. Today, North Carolina has lost its place of leadership and influence on the issue of billboard blight both because the capacity of its roads agency has been all but eliminated or seduced and because North Carolina lawmakers now disregard agreements and enforcement of laws meant to curb blight. Instead lawmakers here recently ignored the wishes of 8-in-10 North Carolinians by granted out-of-state billboard companies permission, free of charge, to clear-cut $5 billion of publicly-owned roadside forests and tripling the cut zone to make the blighting even more apparent. Adding to the injury to taxpayers, many of those sacrificed are among the 5 million trees NCDOT environmental engineers had planted since 1970. The measure has not been extended to interchanges and measures meant to even undermine control by local communities. Proving that roadways are ecological in nature, today roadside environment engineers for the national highways system alone oversee forest acreage that is the equivalent of 14 national forests, enough alone to sequester 91 million metric tons of climate changing carbon. Trees along the national highway system alone are enough to counter the carbon emissions of more than 30 coal-fired power plants. They are equal to the entire forest canopy of Pennsylvania. Roadside engineers clearly understand they are in the forestry business. It has been 84 years since the nation’s chief highway engineer, an Iowan, publically condemned roadside billboards as “national disgrace” and called for them to be banned. It has been 56 years since repeated scientific national and state opinion polls including Gallup have confirmed that the engineer’s sentiments are shared by more than 7–in-10 Americans. Very well done, I have known some of the folks that you mention and you are very accurate with NC road history. There are other indicators that today's Civil Engineers are less concerned with aesthetics than their predecessors. The next trip that you make notice the bridge railings. Civil Engineers used to use designs that permitted viewing rivers and lakes from the bridge. These are million dollar scenic views. You will see these on older highway sections. Today's Civil Engineers use solid concrete walls to screen the view from the public. Some of the first bridge designs used very ornate railing and lighting systems. Later engineers used extruded aluminum rails which was more modern and exposed magnificent views. Another design was to use divided roadways with wide medians in selected areas which enhanced the appearance of the highway and made travel more interesting. Divided roadways in many cases saved construction costs by following the contour of the land. YOU have to speak to your Political Representatives to effect change. Use the media. Engineers are not going to listen to an individual. Governor McCrory; however, might. Call him today and speak up when you get a chance! You as an individual have more power than you think !